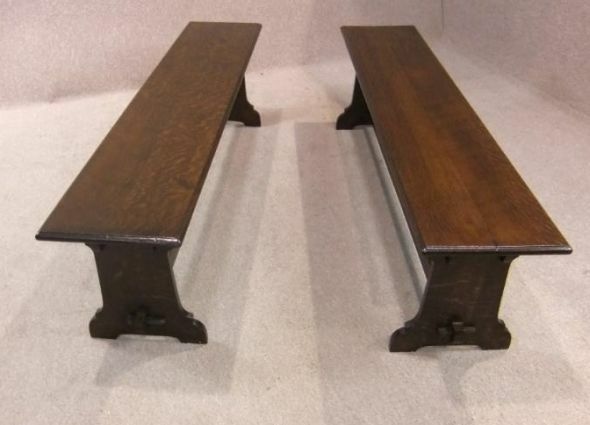 A magnificent pair of circa 1905 solid English oak arts & crafts benches. These benches are in superb condition as they have recently been re-polished to a high standard. They are constructed in the traditional way with pegged ends; ideal for any large hallway, dining room or conservatory. They are in a lovely chestnut colour. Please be aware that these arts and crafts oak benches are antique pieces of furniture; there will be general wear and tear apparent due to their age. DELIVERY - £60.00 to England and Wales. For deliveries outside of this area, please contact us for a quote.